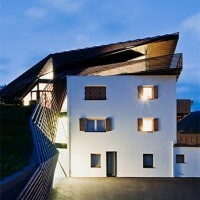 Plasma Studio have designed the Paramount – Alma Residence in Sesto, Italy. 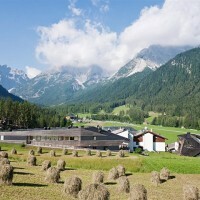 This project was conceived to fulfill a two-part problematic: (1) Residence Alma–a Tyrolean guest house with 6 holiday apartments from the 1960s adorned with a pitched roof–was due for a common circulation and service core, and (2) the project architect, Ulla Hell, was looking for a new home for her young family of five in the mountain community of Sesto, Alto Adige. 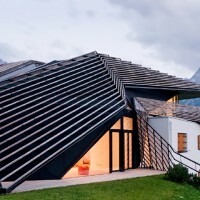 The result: an under-utilized roof space gave way to an angular crown, connected to a ground floor reception space and architectural office by the host’s renovated spine. Having already made their mark on nearby Residence Königswarte with the addition of the Strata Hotel in 2007, Plasma Studio sought to follow a similar skin organization. A timber strip section in larch wood was borrowed from the neighbouring Strata and extruded along two paths. The first stretches across the site, picking up the topography on either end of the building and climbing to enclose a third storey balcony. Here, the edge skirts around the existing footprint, leaving corners exposed to acknowledge its presence. A second path draws the timber skin up from behind, folding around the chimney to return to the ground. Interstitial spaces between the exterior walls and wooden bands swell at ground level to offer sheltered outdoor living spaces. The design team employed parametric modelling software to optimize the density of these timber strips and their metal substrustructure, balancing budget, aesthetics, privacy and views. This approach allowed for flexibility throughout the design phase and output shop drawings for pre-fabricated elements at an efficient pace. The Alma addition departs, however, from the Strata in its approach to volume. 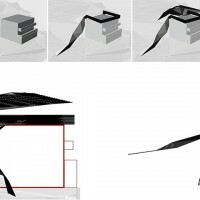 The practical constraints of a multiroom hotel structure called for a regular distribution of modules along a connecting spine. 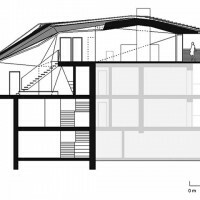 The perceived volume was achieved through horizontal sections around free-flowing terrace spaces. With the Alma, we took advantage of a more flexible program to create unique spatial conditions. These interior volumes are rendered legible from the exterior by the timber strips an honest depiction of the playful activity within. 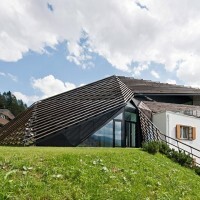 The interior of this family home is characterized by 360-degree views. Perhaps the most spectacular of these being a view of the sky through an incision over the central stair. This opening delivers an immediate reading of exterior weather conditions, collecting precipitation and receiving direct sunlight. The main living spaces are split over two floors with first floor bedrooms off a skylit corridor, and an open plan kitchen, dining and family room encircling a fireplace on the second floor. 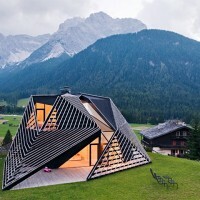 By grouping functional elements in orthogonal cores, the surrounding space is liberated. 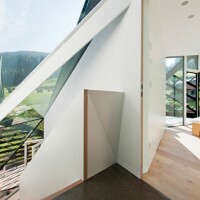 The exterior walls of the main living spaces collapse inwards to catch light, views and varying degrees of enclosure. All living spaces in the private residence have direct access to the outside through a series terraces or gardens. 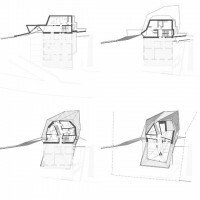 Its multiple access points include: a main entrance through an internal connection to the neighbouring house, a series of openings that follow the natural topography, and an external stair connecting the third floor terrace to the garden. Each inhabitant has come to find their own favourite route. Limited material and colour palettes give strength to the space, with splashes of colour in the children’s washroom. The otherwise white walls provide a backdrop for an ever-changing display of shadows from the pleated roof above. 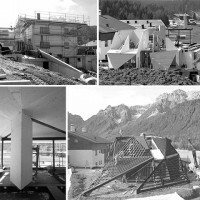 As the extension sits within the steep topography, substructural elements were developed in reinforced concrete, while the superstructure was built from prefabricated cross laminated timber (CLT) insulated with wood fiber and sealed with black bitumen. 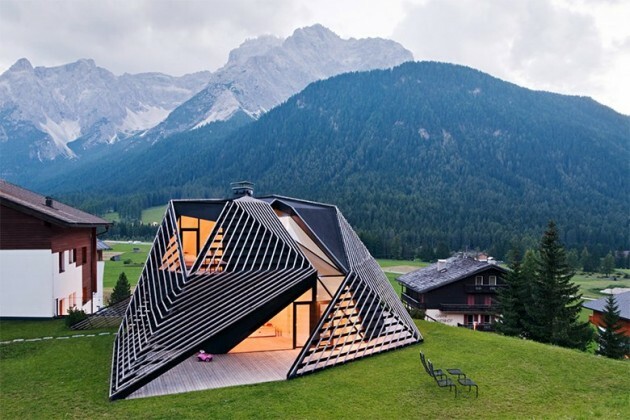 The outer skin in larch wood strips on a galvanized steel structure was determined according to cost and aesthetics by the aforementioned parametric model. A consistently limited colour code was applied to the exterior, allowing the volume to dissolve into the surrounding hillside when viewed from afar. Through its use of form, materials and views, this newly completed addition flirts with its context at three scales. 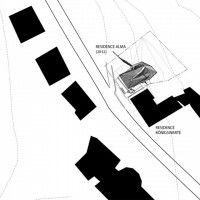 The first, and most immediate, with its host: as an addition to the Alma residence, it shares a newly renovated core, carrying the fractal geometry from the roof down to Plasma’s Italian office through the Alma’s cartesian skeleton. The second, with its neighbour: together the Strata and the Alma define the next generation of the family-owned hotel complex. And finally, with its terrain: the sculptural addition acts, not as a parasite, but as a mediator between the existing house and surrounding topography, extending from the landscape like a lichen.